The Fibs from Prior Day display Fibonacci retracements and expansions calculated from the prior day high and low. The high and low points can be measured from daily data or from intraday data. When measured from the daily data, the order of the retracements may be inverted, if highs and lows were made on the same day. 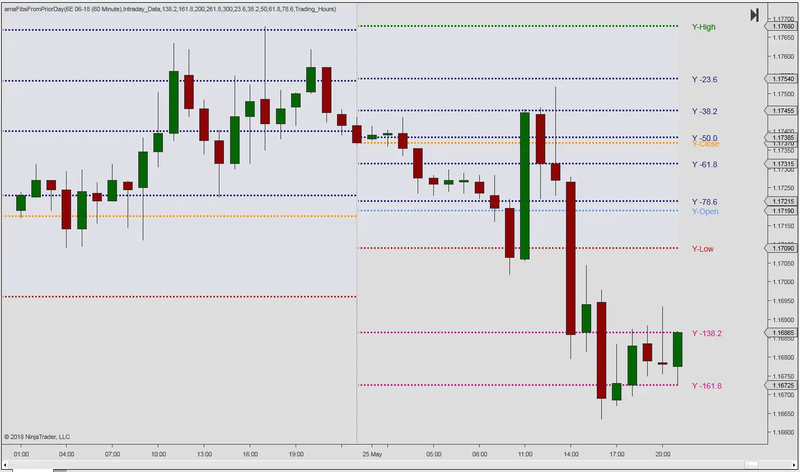 The Fibs from Prior Day can be defined individually. In the event that you’d like to eliminate certain levels, simply set the value for these lines to zero. If you want additional retracement or expansion levels, you may do so by adding several instances of the Fibs from Prior Day indicator to your chart.